GGJ and LVC CALL TO ACTION DECEMBER 3: 1000 DURBANS FOR CLIMATE JUSTICE! - Climate Justice Now!Climate Justice Now! On this day we will join social movements across the globe in creating 1000s OF DURBANS in conjunction with the social movement activities around the UN climate talks in Durban, South Africa. From November 28 – December 9, government representatives are once again gathering for the 17th Conference of Polluters, otherwise known as the United Nations Conference of Parties (COP17) on climate change. Last year at COP16 in Cancun, Mexico, most of the world’s governments — with the notable exception of Bolivia — met to do business with transnational corporations that traffic in false solutions to climate change. Rather than seriously address the urgency of climate change, these governments negotiated the details of polluting and land-grabbing projects like REDD and other carbon market mechanisms, agrofuels and GMOs. These meetings are supposed to be urgent negotiations to cut greenhouse gases on a world scale. But instead of taking big steps beyond Kyoto, they want to throw out any binding agreements and set up new markets to buy and sell pollution and carbon. Social movement delegations will be gathering in Durban to advance climate justice solutions that address these crises at the root, the capitalist system. 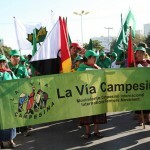 This climate justice agenda includes stopping false solutions like cap and trade, REDDs and other carbon trading mechanisms, and advocating for the principles and guidelines of the Food Sovereignty movement and the Cochabamba Accords. It also includes pressuring industrialized nations to adopt the science-based emissions target reductions outlined in the Cochabamba Accords: a reduction of 50% of current levels by 2017. 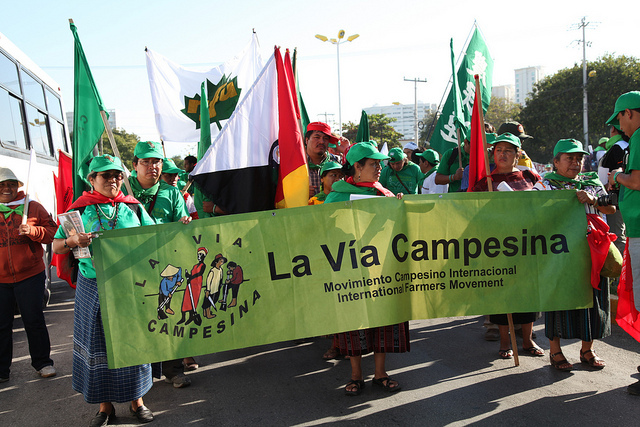 Grassroots Global Justice Alliance (GGJ) and La Vía Campesina North America are joining forces to mobilize our memberships for this day of action to “bring Durban home”. Saturday, December 3rd will be a day for people across North America and around the world to denounce the system that allows corporations to profit from harming our communities and our planet. A day to demand that big polluters clean up or close up . It will be a day to connect the climate crisis to the economic crisis and to say – we will not let corporations continue to profit from pollution! We are calling on all GGJ and Via Campesina U.S. members and allies to do events in your own cities and regions. The events could be actions or political education events that expose the corporate polluters in your area, or that highlight the environmental justice or climate justice solutions already in place in your area (community lands/ gardens, pesticide and GMO free production, local family farmers markets, toxics cleanup projects, real renewable clean energy policies etc.). We also invite members to link their actions in solidarity with struggles globally against landgrabbing and other so-called “green” capitalism projects which in fact are harming the environment and displacing communities. At Durban COP17 we will reject any attempt to extend the toxic carbon market and will reject any attempt to develop offset mechanisms including REDDs and soil carbon. We will expose the false solutions dressed up by the World Bank as support for small farmer agroecology or “Climate Smart Agriculture”. Just as in the case of REDD for forests, the voluntary soil carbon market will put the carbon in our soil into the hands of polluting corporations in the North. It will become another space for financial speculation and a carbon bubble that could burst just like the housing bubble. Farmers and farmworkers will receive pennies while speculators make exorbitant profit off the commodification of carbon in soil. This is the same corporate-led agenda that has led to rising sea levels, rising food prices, increased flooding and drought in many parts of the world, and the massive migration of rural peoples due to displacement by deforestation, desertification and now speculative land-grabbing. The “cornerstone” actions in the US will be actions to stop the TransCanada Corporation’s Keystone XL Pipeline designed to carry synthetic crude oil from the Tar Sands in Alberta throughout the Western Plains, Midwest and Southern US. These actions will highlight who would profit and who would suffer if the Keystone XL pipeline gets built. The current stretch of the Keystone pipeline running through the Western Plains states of the US has already resulted in twevle devastating oil spills. First Nations, family farmers and communities in those states have actively opposed the continuation of the pipeline, built and managed by the TransCanada corporation, due to fears of the polluting impacts on soils, forests, water and communities. These same groups also oppose government supported corporations’ harmful “fracking” in the search for additional fossil fuel reserves. “Our water is like gold; the pipeline threatens some of the American heartland’s most sensitive lands, now productive agricultural land, as well as the Ogallala aquifer, the Yellowstone and Missouri and many other rivers, and other drinking water supplies.” says the Western Organization of Resource Councils. Farmers and ranchers, landowners, steelworkers, and environmentalists have joined First Nation tribes to warn that construction of three massive pipelines would threaten communities across the West and Midwest and increase greenhouse gas emissions by 17% over other types of oil fuels. The US and Canadian governments show no intention to protect our land, water and livelihoods as they continue to support big corporations who exploit and pollute. Whatever your local mobilization may be, we are asking all participants to take one joint action together: gather signatures for a petition that targets the U.S. Department of State for its role in supporting the corporate polluter agenda. Specifically the petition will demand that the Department of State deny the permit that would allow the TransCanada Corporation to build this destructive pipeline. Our goal is to collect 5,000 signatures to turn into the State Department the week of December 5th. STOP THE CARBON MARKET BUBBLE AND OPPOSE GREEN CAPITALISM! OUR PLANET IS NOT FOR SALE! COMMUNITY SOLUTIONS COOL THE PLANET! FOOD SOVEREIGNTY COOLS THE PLANET! This entry was posted in Climate Justice activities, Durban / Mobilisations, Toward Durban and tagged Africa, carbon market, durban mobilizations, Grassroots Global Justice Alliance, green capitalism, landgrabbing, REDD, Via Campesina by admin. Bookmark the permalink.